Do you actually need an office? The quote above is from “Remote: Office Not Required“, a book written by DHH and Jason Fried, the two founders of Basecamp. If you’re an entrepreneur trying to build a remote team, or you’re a freelancer, this is one of the must-read books. It’s filled with concrete, actionable advice on how to become more productive and make sure that you (or your team members) don’t procrastinate. 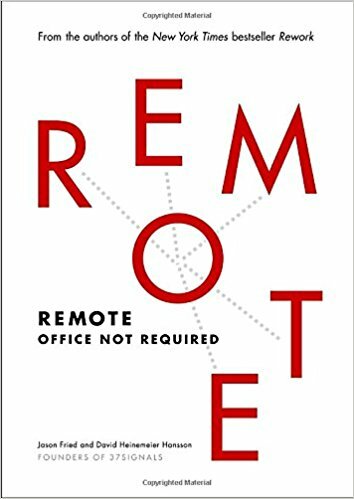 The book demolishes the preconceptions and myths related to working remote, shows you the advantages, but also any possible challenges you might encounter and how to overcome them. 1. The only visible metric left is the most relevant one: the quality of your work. That means you won’t be evaluated based on office politics anymore, nobody will care at what time you get to the office, if you leave earlier than anyone else, or how many breaks you take during the day. 2. You’re actually able to focus more and do more work, as nobody will interrupt you with something “urgent” right when you’re in your flow. You won’t have to listen to your colleague’s small talk or loud eating noises. 3. Think of all the money and time spent on renting an office, lunch in town, and commute. Do you really need a physical office? Think about it: you probably already have remote workers on your team. I’m talking about your lawyers or accountants – it’s likely that you outsourced these. Remote working isn’t about watching TV series all day long, playing video games, or taking afternoon naps (nothing wrong with that, actually – it might be a great productivity hack 😛 ). I’m gonna tell you a short story from my own experience. During my professional journey, I made a series of mistakes that eventually forced me to postpone my entrepreneurial dreams for a while (more on this at another time) and get a job, working in a digital marketing agency. I’m the type that loathes social conventions, and that brief experience in a “traditional” work environment was horrible. I remember being judged by my manager based on the hours when I left the office, instead of the actual quality of my work. I preferred to wake up earlier than anyone else and work for a few hours from home, before coming to the office and risk being interrupted by others (mornings still are my most productive moments), but this part wasn’t visible. Also, most of my colleagues were spending (and wasting) precious time on their personal social media accounts, while I was actually doing my work! But, somehow, none of these mattered. Just because someone’s physically present in an office, doesn’t mean they’re actually doing quality work. And if I didn’t convince you, perhaps Richard Branson will: he’s one of the entrepreneurs who recommend the book “Remote”, and even wrote an article on his blog about this, called “Give people the freedom of where to work“. What’s your experience with remote working? I’d love to hear your thoughts on this. P.S. if you want to become an entrepreneur, we might help you figure out what books you need to read – the ones that are filled with actionable advice and fit your context and needs, not the fluffy, media-hyped, bullshitty books. You can start by subscribing to our newsletter and every week you’ll get from us useful recommendations.